Like many of us here at Laudisi, Thomas has relocated to South Carolina, and we're incredibly excited to have him as a Shipping Associate. Hailing from New Jersey originally, he's creative and ambitious, with much of his free time devoted to music. 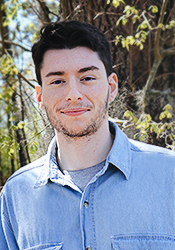 Thomas plays guitar, bass, and drums, and when he's not rocking out or writing his own music, you can find him listening to a variety of genres or diving deep into in philosophical literature.